The fifth day of the Navratri festival is dedicated to the worship of Goddess Skandamata. After worshipping Goddess Kushmanda on the fourth day of Navratri, the devotees observe and perform Skandamata Puja on the fifth day. ‘Skanda Mata’ is considered as the fifth incarnation of Mother Durga. Skanda Mata is the mother of Lord Kartikeya or Skanda who was picked out by the Gods as their commander in the battle against the demons. This is why she is accompanied by Lord Skanda in the figure of an infant. She rides a Lion and takes her son Skanda in her lap. 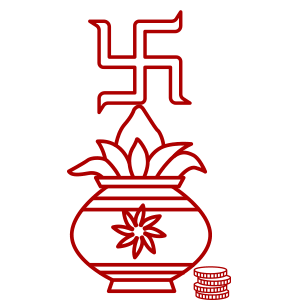 She is said to have three eyes and four hands; two hands display granting and defending Mudras while the other two holds lotuses. She is worshipped to achieve salvation, power & prosperity. It is regarded as one of the most significant and aspiring forms of Goddess Durga where Maa Durga as Skandamata Devi carry her divine child Lord Kartikeya as an infant. The deity appears highly benevolent and joyful in such appearance. The face of Goddess Skandamata showers affection and love on her devotees similar to the way she loves and protects her own son Kartikeya. Read more about Puja Vidhi for Skandamata. As per the Hindu scriptures, it is believed that devotees worship Goddess Skandamata so that they can attain salvation and wisdom. Goddess Skandamata possesses the power to instill knowledge even in the devotees who are illiterate. Goddess Skandamata bestows the devotees with prosperity, wealth and fame and also takes care of the devotees like her own children. The devotees who worship the Goddess with utmost devotion and sincerity are free from all kind of difficulties and problems. All the desires of the devotees get fulfilled and their lives are filled with supreme joy as a result of worshipping Devi Skandamata with supreme devotion. Also visit Famous hindu festival. As per the Hindu Mythology and Shiva Maha Purana, once there was a great demon named Tarkasur who pleased Lord Brahma with his harsh penance and true devotion. As a result, Tarkasur asked Lord Brahma for immortality. Lord Brahma explained Tarkasur that no one can escape death and thus he cannot grant such a blessing. Tarkasur played smart and wished for the death only by the son of Lord Shiva as he was aware that Lord Shiva would not get married anyway. Being pleased with the prayers and devotion of Tarakasur, Lord Brahma granted his wish. Being aware of the fact that now he is immortal, Tarakasur started destroying the Universe. All the devtas went to Lord Shiva to seek his help and requested the deity to get married. To this, Lord Shiva married Goddess Parvati. Lord Kartikeya, son of Goddess Parvati and Lord Shiva killed Tarkasur. Since that time, Skandamata is signified as a symbol of a relationship between a child and a mother. Remedies to astrological problems - Talk to Astrologers.